Hugging America is creating a heart-centered hugging movement to heal the USA! Thank you so much for making your way to our Patreon page for Hugging America. We have some really big plans for the future and we are asking you to be a part of it all! EACH DOLLAR DONATED MONTHLY SUPPORTS OUR HEART MOVEMENT OF SPREADING DIRECT HUMAN CONNECTION AND COMPASSIONATE LOVE VIA "FREE HUGS HERE" signs AND TRAINING VOLUNTEERS across AMERICA'S CITIES to serve LOVE in their communities. HUGS ARE DIRECT HEART HEALING ENERGY AND YOU CAN DO THIS TOO! 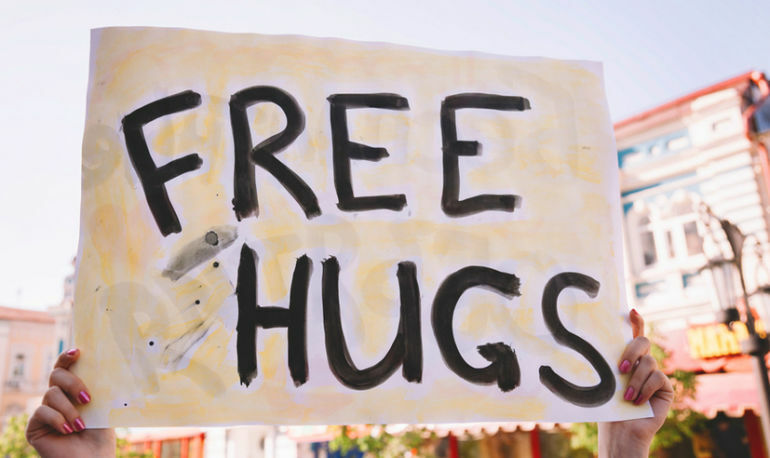 HUGGING AMERICA has grown from a single act of VULNERABILITY to a global, FREE HUGS HERE MOVEMENT / #lovebomb that connects people in a deep, spiritual way and creates a lasting effect of loved-based presence. AMERICA NEEDS HUGS, NOW MORE THAN EVER! "Everyone needs at least 5 hugs per day for human maintenance." And there are dozens of other health benefits! We've made the decision to be an ARTISTS and EVANGELISTS for HUMAN connection and community by giving Hugging America our full energy. It's time to be a full-time Agents of Heroic, Uninhibited Innocence. Courage tells us to dedicate ourselves to this art that our LOVE FOR THE WORLD brought out in us together via this daily #lovestunt. Spreading Love, Person to Person, One HUG at a Time. Cat and I together, honestly, cannot thank you all enough for being such delightful, beautiful, heart-full friends and followers! YOU ARE CHANGING THE WORLD TOWARDS LOVE. "Do the best you can until you can do better, then do better"
Our goal with this ongoing campaign is to raise funds that support a full-time lifestyle of travel so we can create public acts of #loveart daily and document the journey. In short, we want to #lovebomb the world EVERY.DANG.DAY with FREE HUGS! WE HUGGED FOR 24 HOURS STRAIGHT during Burning Man 2017! * Hugging America was the crucial turning point in a Cadillac ad, aired during the Oscars, that encouraged viewers that we are ONE! FREE HUGS via Hugging America is seen by MILLIONS! Tex often goes out in public with a blindfold and wears it during hugs as an act of TRUST. WE TRUST in the magic that happens when we've got our arms open and the eyes you've opened in us are looking for another moment to express compassion and love and tell the stories of those connections through hugs. We want to build a career of dramatically and lovingly telling stories and painting life with the participation of those we meet on our journey. AND as ALWAYS, we'll gladly accept your continued cheers, hugs, "LIKES", shares and contributing posts to our walls as we keep Spreading the Love, Person to Person, One Hug at a Time. It's YOU who built the foundation and continue to make this inspiring dream possible! Each dollar donated supports Hugging America and our efforts to serve love across the USA. SUPER HUGGER! You get access to special posts and Hugging America videos on a daily basis as we adventure around the USA!